According to Contact Report 104, on March 18, 1978, Meier was taken on a time travel trip into the future to witness and photograph the aftereffects of the inevitable mega-earthquake event that will occur in San Francisco at an unspecified time in the future. During this trip, Meier allegedly recorded the destruction of San Francisco on his camera loaded with a negative film. He also photographed the fissures of the San Andreas fault located around 300 kms away from the city. After the trip Meier was allegedly brought back 30 minutes earlier than the time he got up from his bed for the contact. It was reported by Wendelle Stevens that on one evening during their visit to Switzerland in 1978, Meier showed the 11 color photos from his time travel trip to about 9-10 people who were sitting around the kitchen table, including Wendelle Stevens himself and his co-investigators Lee and Brit Elders, Meier’s ex-wife Kalliope and others from the group around Meier. After a few days, it was claimed that Meier's photos have come from a painting published in an article in GEO magazine in September 1977. And soon afterward, according to Contact Report 106 from April 10, 1978, these 11 color photos along with their original negatives were taken away from Meier by the Plejaren ETs and were never returned again. 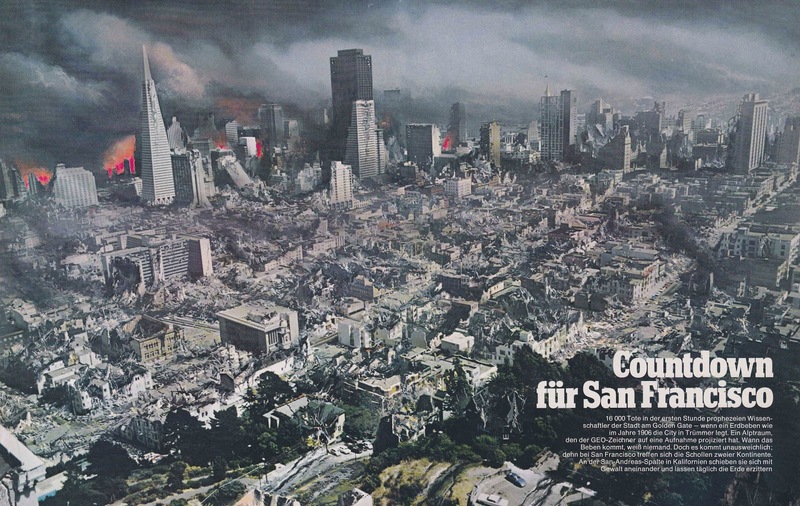 Did Meier really photograph the destruction of the future San Francisco earthquake event?